Ha... It was a busy day... the day he got a name, at least officially speaking. They always call a baby with thousand names anyway but the one name that is used formally is given on this day. Now, he is called Krishna... (based on Lord Krishna, born in the same town as we live in). The ritual was long and tiring, but we all go with it. I am not best equipped to explain all the logic and reasoning behind it, but will try to post enough images to show how and what happened. Here's the formation of the worship place, wherein the priest would summon all the gods and goddesses to be part of the procession. Herein rice plays an important role, along with the water brought from Ganges. Chosen fruits which have seeds in their core play a rather important role. 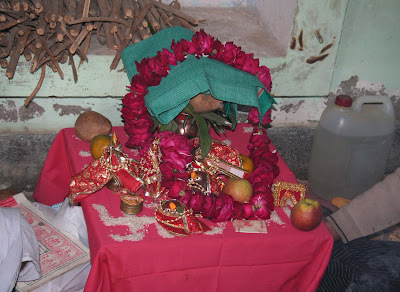 Every indian house has a place of worship, which has idols of the favourite gods. On occasions like these, the idols are brought out and worshipped along with other religious proceedings. Further, there is havan, wherein a small pyre of fire is lit, which is fed purer stuff, e.g. pure butter, wood from the pipal or mango tree etc. After the chanting is done, the pyre (with fumes still emanating) is taken across the household (so that the fumes spread). As is visible from the snaps, the new parent couple sits together in the process, praying to the almighty as single person (the couple acting as one unit). 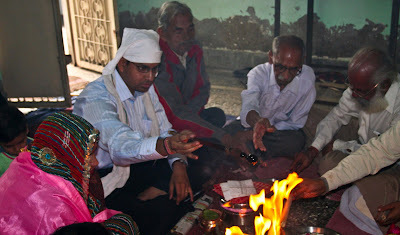 In the havan process, the male puts in the butter to the fire, whereas the female puts in the havan Samagri (a mixture containing many things meant to generate pure fumes). After the havan is done, the newborn is handed over to the grand father, who would then let baby know the names of the 7 generations of the baby. Well, thats when my father (baby's grandpa) whispered the new name to the baby through a funnel made of beetle nut leaf. From priest's version, the funnel should be made of gold, but he would make do with this workaround. Such workarounds are very common with Indian rituals. The scriptures, where there are methods advised to perform a certain ritual, refer to the process as if a king would be performing such ceremony. However, in real life following the scriptures is practically impossible. So, such workarounds are more and more common during such ceremonies. 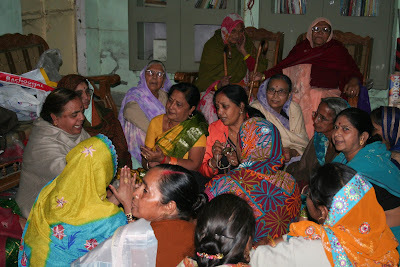 And then there is celebration from the womenfolk of the home and neighborhood. 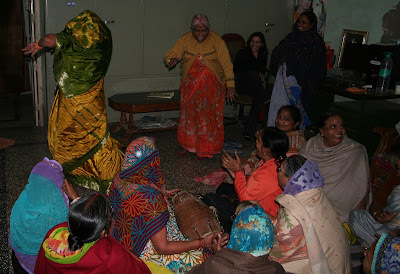 There is song and dance in praise of the newborn, wishing him good, in comments/taunts (all in good humour) to the new parents, grandpa and other relatives.